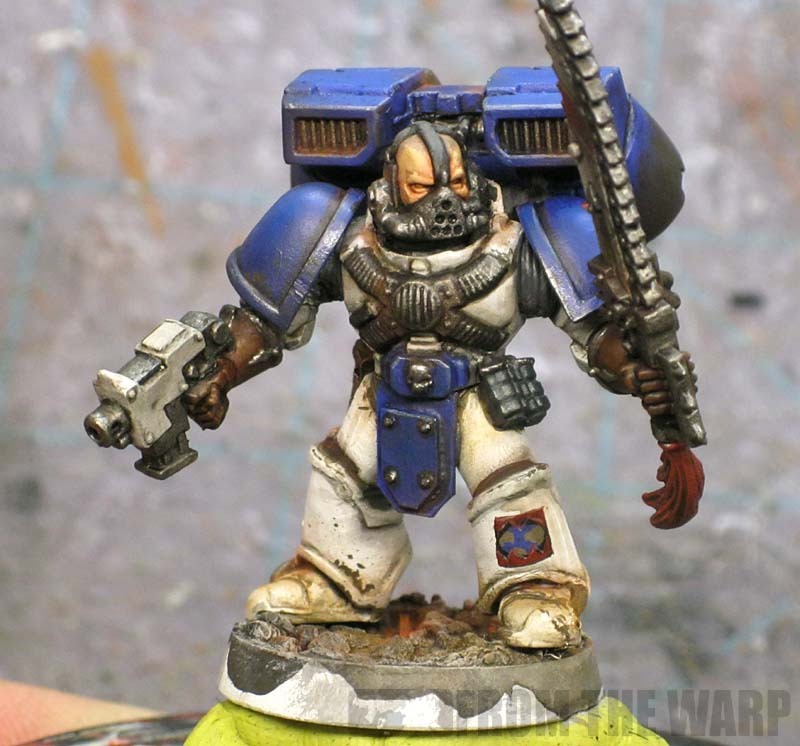 I get lots of questions about how to paint this color or that color on a model. In my reply, I always end up trying to explain why a particular color is "easy" or "hard" to paint in the process. 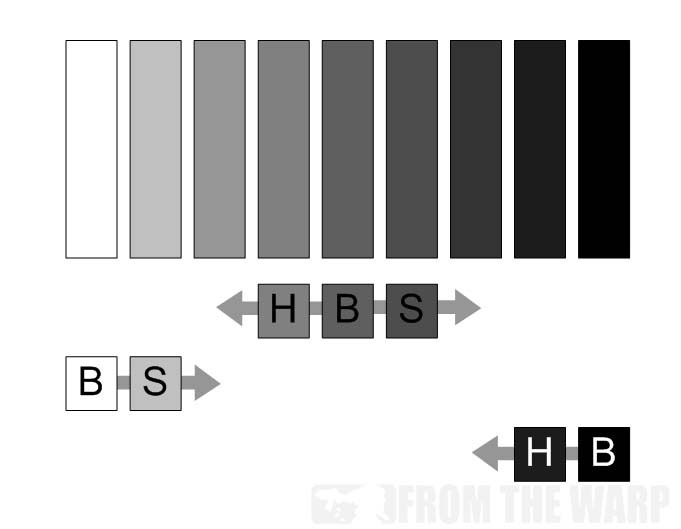 I've decided to try and explain why some colors are harder to paint than others in the way that I think about it. Now I'm not sure that harder is the word either. It might be more of a case of certain colors requiring a different approach. One that is not often done and that is seen as being "harder" to do. So let's get into the explanation then. I chose my Pre-Heresy World Eater model there because he includes colors that are perceived as both hard to paint and easy to paint. He's got white which can be tough and requires a particular approach and blue which is often seen as easy and uses another approach. 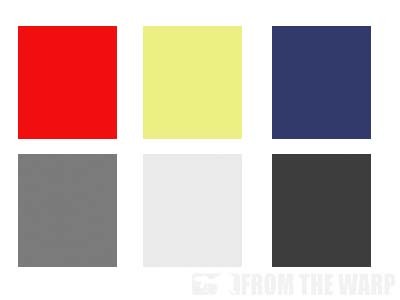 From here on out though, we are going to remove the hue (red, yellow, green, blue, etc.) and only be dealing with values (the degree of light or dark as compared to something else). Every color, if you remove the hue, has a value. Here's what I mean. No matter what color you take, you can remove the hue and look at it as a shade of grey and determine what it's value is. Once we know that all colors have a value relative to what's around them, let's look at why some values are harder to paint and make them appear as though they have dimension and aren't just flat. We'll use this box as our example. 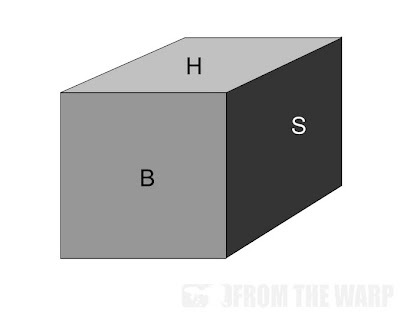 If we paint it our base color (B) on all of the sides, it appears flat. We need to add some shading and a highlight in order to make it look like it's a shape (box) and it has dimension. And here's our dimensional box. 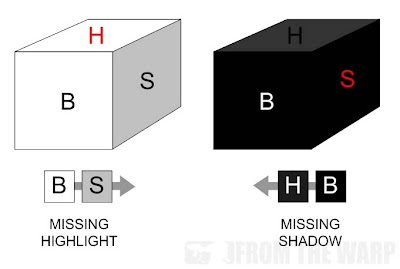 Our base color (B), our shade (S) and our highlight (H) all work together to give us the impression that the object in front of us is under a light source and actually has a shape to it. Our base is one value, our highlight is slightly lighter than that and our shade value is slightly darker than our original base color. Ultimately you can do more than one highlight or shade, but we're going to keep it simple for the discussion today. So why are some colors harder to paint? Because of their value. Depending on where a color falls on the scale when you convert it to a value will determine what other values you have to work with for your shading and highlighting. 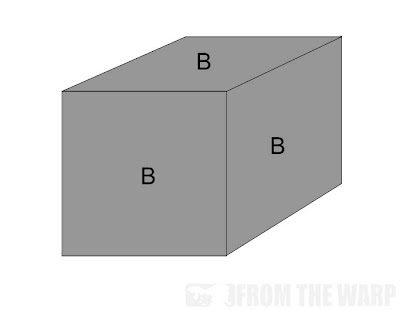 Look at our middle base (B) example. Since it falls in the middle of the value range, we have room on both sides for a shade and a highlight value. It's very easy to make this value (color) appear to have dimension. If we look at our far right base example (black), we have no room to shade it. We are going to have to rely on highlighting alone to give the piece dimension. This can be tough because highlighting can be done by drybrushing (which can often be messy) or line highlighting which can be tedious and time consuming. So how do people solve painting black? Sometimes they use a very dark grey for the base and move back towards the middle of the grey scale slightly so they now have room for a shadow to help define the shape in addition to the highlight. If we look at our far left base example (white), we have no room to highlight it. We are going to have to rely on shading alone to give the piece dimension. This can be tough since most of our shading is done with washes and such and unless we are very careful in their application, they can quickly darken down the whole piece and we no longer have the light base color we want. And how do folks solve painting white? Sometimes they use a very light grey for the base and move towards the middle of the grey scale slightly so they now have room for a highlight to help define the shape in addition to the shadow they already have. Next time you look at a color, think about its value. Do you have room on both sides of it for your highlights and shading? The answer will almost always be yes. It's not until you get closer to the ends of the spectrum that your options start to dwindle down and you need to start looking around for solutions. Colors (values) at the ends of the spectrum aren't impossible to paint, you just need to think about them first. Now there are a few other factors to consider as well like the transparency of your color and how many coats it's going to take to get a consistent finished coat (remember Foundation paints?). Another thing to keep in mind is primer color. Try and match it's value to your base color value so it doesn't alter your base color or make it so you need to do a million coats to cover it. If you've got any questions about something in this post, shoot me a comment and I'll be glad to answer. Make sure to share your thoughts on why some colors are harder to paint than others in the comments below! Awesome tutorial. Thanks for putting these concepts into easy to digest chunks! Really helpful article!!! Thanks very much. This is a spectacularly good article, Ron! Thanks for putting this together - I'd never quite thought of it in the 'value' contex, and it make absolute perfect sense. Excellent, glad you guys like it! I have few more along this line that I'm working on as well to help folks expand their painting horizons. I will add that when you're painting black you don't actually have to paint black -- you just need to give the eye the IMPRESSION that the surface is black. You can paint your highlight in a colour complimentary to the model and then shade down to black -- that highlight can be any dark colour and the transition to black just blends down. We call that cheating where I come from and it works like a charm. Good stuff, Ron. It hits on the kind of things I learned in art school, but like Asmodai said, in easy to digest chunks. I've found that I do alot of things like this as second nature (I've been using acrylic paints for 30+ years) and constantly have folks ask me how I get certain effects, but its often hard for me to explain. Really nice tutorial. I'm going to highlight it on my blogg (not that it gets THAT much traffic) because it was really well done. This is a very good article Ron. Justin McCoy: Very true. Same thing goes with conversion work too. You don't actually have to convert the very thing as much as you need o make sure the viewer gets the right impression when they look at the model. Rednekkboss and Oz Dazza: Thanks guys! About to tackle painting my Ravenwing and been struggling with the black on the test model. This gives me this plan I need to proceed. Sotnia: Sorry about that. To be honest, I went back and forth with posting it thinking it might not be what readers are interested in reading. I have a couple more like this that I'm working on now that I know folks like this kind of "theory" stuff. Ron quite often when you post something like this I start off thinking "Bring on some cool modeling stuff and great painting". Then I read it and sit here thinking, "Dam I've had asshats trying to explain that to me for years and none of them ever made any sense, but that just made sense and now I get it." Gary: Glad to know it helps. Sorry you haven't been able to find the information elsewhere in the hobby sooner. Years of bad info can make from some not so fun hobbying. For model painting I'm pretty much a lone island. I was they guy that painted figures for everyone in the D&D game. Everyone I've asked the advice from are "artists" not model painters. Gary: Ahhh, I see now. Model painting does have some unique characteristics to it now that I think about it. Jorge: I haven't forgotten about you. I have to juggle my hobby time with other things right now. I'm determined to get a "yellow" marine done though. No problem, keep up with the excellent work!! !